A £50/week non refundable deposit is required to secure your booking. The balance is to be paid 4 weeks prior to the start of your holiday. A £50 refundable damages bond will also be required to cover any damages or loss of items from the caravan,which will be payable along with the remaining balance, this will be refunded upon completion of inspection/cleaning of caravan after your departure. Bookings made within 4weeks before the start of your holiday date must be paid in full at the time of booking! Payment can be made by cheque or bank transfer. !!!! Please quote St Austell 16 when checking availability by phone or email as we have two caravans available for hire at Liskey Hill !!!! !! !Pillows and duvets are provided but you will need to bring your own bed linen (duvet cover,pillow cases and sheets),tea towels and bath towels !!! !! !Dogs are welcome to holiday at no extra cost but we ask that they are kept off the furniture and are not left unattended in the caravan! Dogs must be on a lead at all times when out on the site!!!! Gas and electricity are included in the price! When enquiring if you could Quote caravan St Austell 16 and give the dates you are looking for and for how many guests(adults & children) and any pets in your party. If you could leave your mobile number if possible,thank you. Please feel free to email, call or text me for any extra information at any time!!! 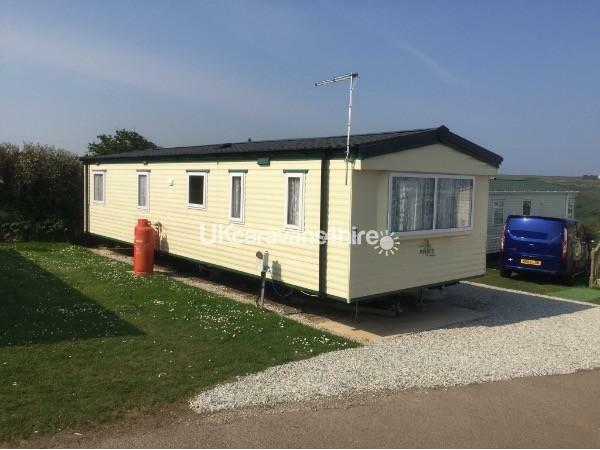 We would like to welcome you to our families 8 berth, 3 bedroomed gold rated caravan situated in a quiet location on Liskey Hill Holiday Park. 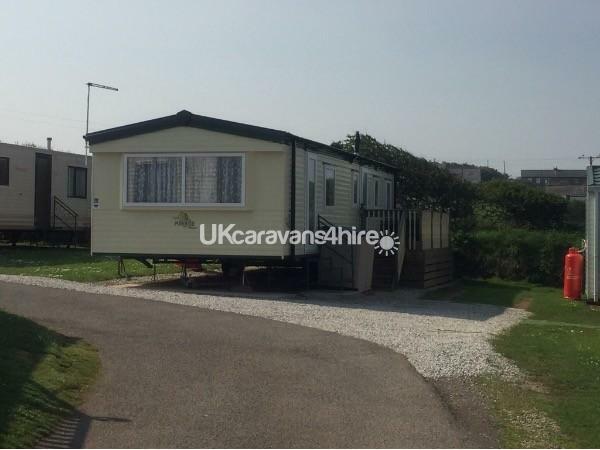 With views of the countryside and the sea and within walking distance of the very popular holiday village of Perranporth and its beautiful 3 mile long sandy beach as seen on bbc TV's Seaside Rescue. 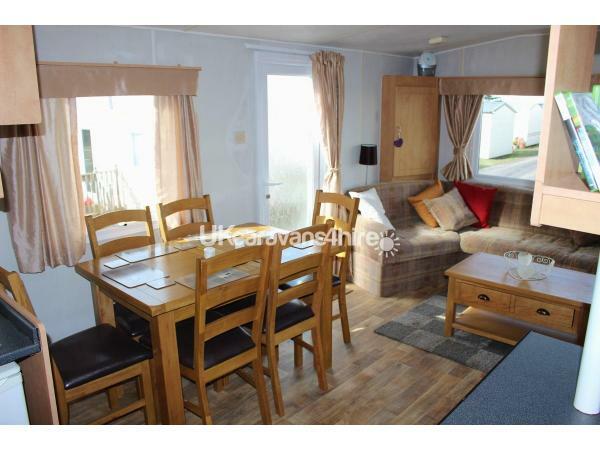 Our Caravan St Austell 16 comes fully equipped with everything you will need to enjoy a stress free holiday! The kitchen is fully equipped with fridge with freezer box,microwave, toaster and all utensils required, but for those wanting a relaxing cooking free holiday Perranporth is just a two minute drive away with a variety of pubs, restaurants and takeaways to suit all tastes! The living area is equipped with TV and DVD player with a selection of DVD's for you to relax on the occasional inclement day. 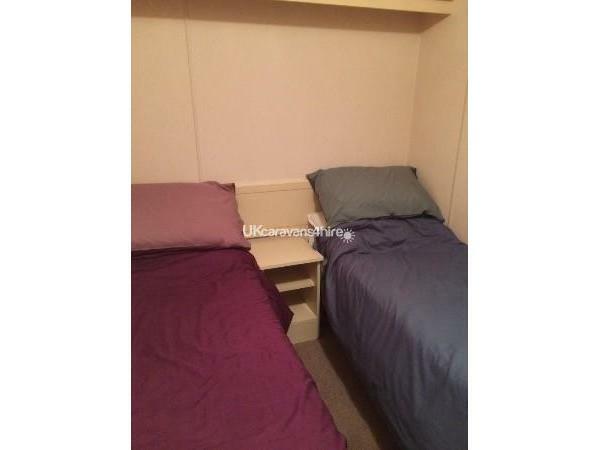 The 3 bed rooms are one double and two twins, there is also a double pull out bed in the living area. 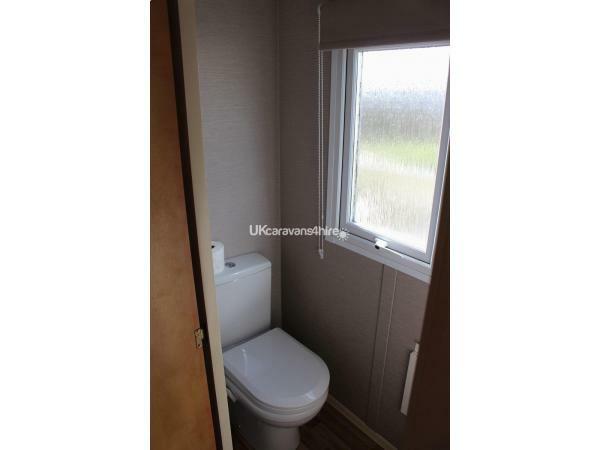 The shower and toilet are located in separate rooms for added convenience. 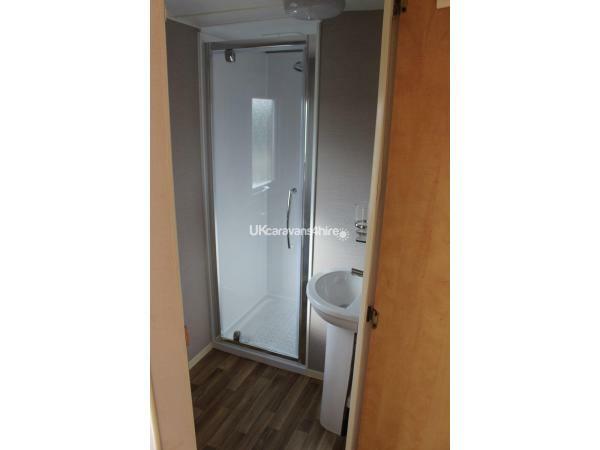 St Austell 16 is fully double glazed and has gas central heating throughout for extra comfort. 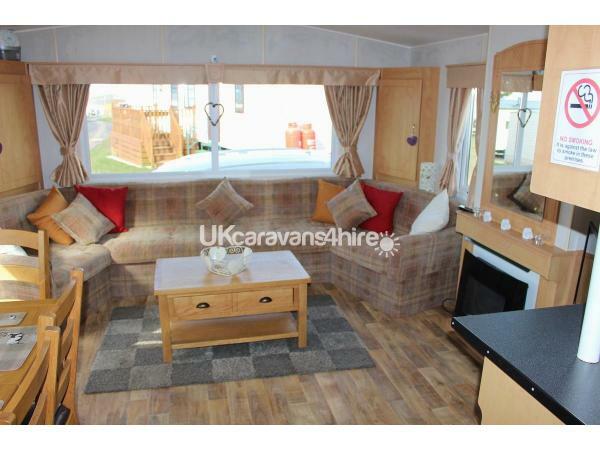 Outside the caravan is the newly installed totally enclosed decked area with table and chairs for you to unwind with a chilled drink and take in the sunset over wonderful country views after a long day on the golden sandy beach! Beside the caravan in a storage box is a selection of beach toys and games for the kids to use to make their stay more enjoyable. We hope you love our caravan, Liskey Hill and Perranporth as much as we do,which is why we make the 1500 mile round trip from up here in North West Scotland. The caravan is fantastic. Communication was good prior to our holiday. Documentation arrived well in advance. The site is a great location for walking to the beach or exploring Cornwall. 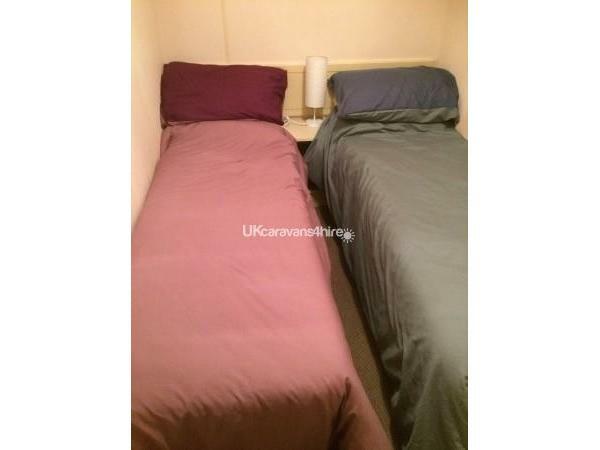 The caravan is spotlessly clean, very well equipped and felt like home from home. 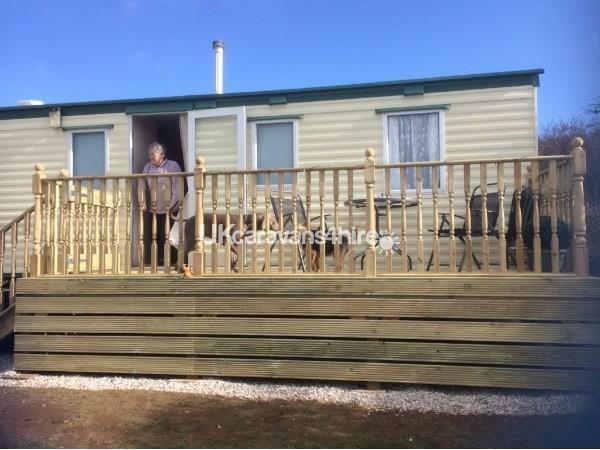 The caravan location on the site is perfect, with amazing views you can spend a relaxing evening with a glass of wine taking in the views on the decking. We will definitely be returning in the summer. Thank you. 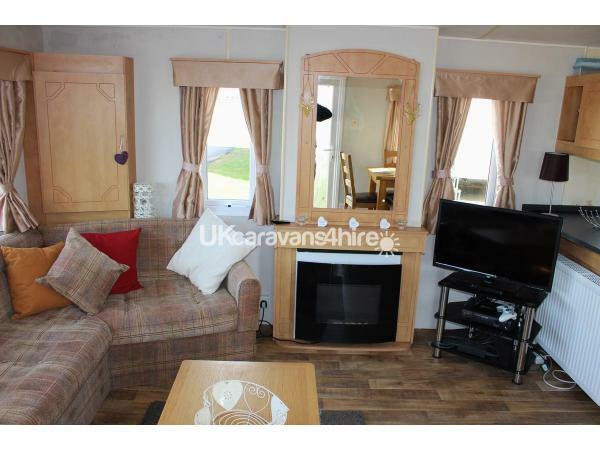 This caravan was more like a home from home ,a fantastic base to enjoy a perfect holiday.Norma, the owner is helpful and friendly and I would recommend this caravan to anyone.It is clean,fully equipped,spacious but above all somewhere you look forward to going back to after a day on the beach etc,would we return? Definitely. Excellent! 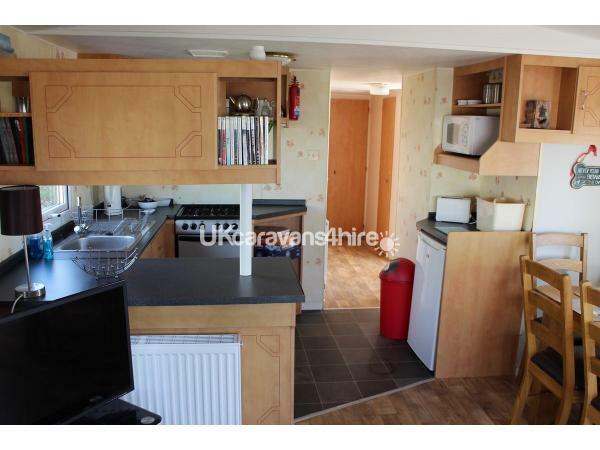 Great communication from owners, caravan was absolutely immaculate. Lovely sitting out on deck enjoying the view with a nice glass of wine. I have been recommending to family and friends. Thank you so much. Thankyou for your comments.. We are so glad you enjoyed your stay in our caravan.